If you have read my last two posts Dazzled by diversity and Layers of meaning at #Fedwikihappening, you will know that I was one of the privileged people who took part in a Fedwiki Happening, led by Mike Caulfield, and inspired/ supported / birthed by Ward Cunningham. It has been an amazing experience. I reflected before the happening (from reading about fedwiki), I reflected during it as I played and puzzled and learned (about what I could do and what I didn’t know). I am reflecting now, and I am sure will still be reflecting in the months to come so please don’t taken anything written here as other than provisional. The first thing to say is that I have learned more about some very interesting topics posted, edited and linked by happening participants. Here’s a flavour – if you track across the versions of the page, you can picture the development of the ideas http://frances.uk.fedwikihappening.net/maha.uk.fedwikihappening.net/illuminating-a-path/catherine.uk.fedwikihappening.net/illuminating-a-path/journal.hapgood.net/illuminating-a-path/kate.au.fedwikihappening.net/illuminating-a-path. I would like to reflect further on the enticing possibilities of intimate and rich collaborative writing with Fedwiki but in this post I’ll share my concerns about the uncertainty that newbies may experience. In one of the daily newsletters, Mike shared a published exchange between students (not his class) where the punch line was ” <name> DO UR OWN PAGE”. The moral that Mike (quite rightly) drew out of this was that much of students’ experiences of wiki was more like a lego bricks placed side by side rather than true collaboration where their bricks made a magnificent structure. Well of course that is true, but I am a Brit and I couldn’t help thinking about that underdog student. What if they were frustrated by their lack of understanding of the wiki technology, and that student who edited their page was really painful outside class, and was now trying to squash them in the wiki. So I can imagine that in Mike’s classes where he knows and listens to students, and gives them lots of support and opportunities to vent that could be solved but out in the wild, learners could think they have to put up or shut up – so they turn off. I like diagrams so I decided to invent a development process for a post, offer two interpretations, share it at #fedwiki and see what people say. Here is what I have just posted at #fedwiki – please don’t take it too seriously. Note: This is not based on the history of a particular post but is sparked by some observations of forking at fedwikihappening. No doubt the tales contain inaccuracies but are intended to open up discussion of the social and technical practices around forking. These tales are two different interpretations of the development of the post shown in the diagram. Shilpa posted about bug-eyed monsters on Monday morning. Siobhan noticed the post as she was very interested in bug-eyed monsters and immediately tweeted Shilpa (whom she knew from the Bug-Eyed Monster Society) to let her know she was forking her post and adding to it. On Tuesday morning Rajesh noticed Siobhan’s edit of the post . He forked it and contacted his mate Tom via Twitter as they had a mutual interest in bug-eyed monsters. They tweeted back and forth, then met for coffee on Wednesday morning. On Wednesday afternoon, Tom forked the post and made substantial edits. Tom and Rajesh felt that they had really built on the original ideas from Shilpa and Siobhan. Meanwhile Shilpa saw Siobhan’s post (as she but not Rajesh was in her neighbourhood), forked it and added to it, letting Siobhan know what she had done, and Siobhan responded by forking and editing on Wednesday morning. On Wednesday afternoon, Shilpa checked the Conversation Club, rather than her usual approach of Recent Changes in her neighbourhood. She was really surprised that the new and improved version seemed to be missing Siobhan’s and her recent additions. Kurt scratched his head. On Tuesday morning Rajesh noticed Siobhan’s edit of the post . He forked it and contacted his mate Tom via Twitter as they had a mutual interest in bug-eyed monsters. They had already decided not to join the Bug-Eyed Monster Society as they really disagreed with their hypotheses on the reasons for the bugginess of the monsters’ eyes. They tweeted back and forth, then met for coffee on Wednesday morning. On Wednesday afternoon, Tom forked the post and made substantial edits to correct what they saw as the mistakes that Shilpa and Siobhan had made. Meanwhile Shilpa saw Siobhan’s post (as she but not Rajesh was in her neighbourhood), forked it and added to it, letting Siobhan know what she had done, and Siobhan responded by forking and editing. On Wednesday afternoon, Shilpa checked the Conversation Club, rather than her usual approach of Recent Changes in her neighbourhood. She was really surprised that the newest version of the post was so radically different from the one she had been working. She wondered what to do next. Kurt sighed. We could write another version of this tale where Kurt invited Shilpa, Siobhan, Rajesh and Tom to a Google Hangout , and they came up with ideas on how to restructure the post into a series of linked posts that displayed the alternative theories on bug-eyed monsters. But, but, but … Kurt was an old hand, the others were new and were still learning about forking, journal and the implicaions of neighbourhoods. Also, the technology is quite new, operating across servers in different continents and time zones. In a context where there is socio-technical unpredictability, maybe we need Repair Strategies. I would love comments, here or at #fedwiki on Twitter or on the post at #fedwiki itself. I will try to collate what I have learned and repost at all three places. Hi Frances – thanks for these interesting reflections and stories about ‘forking’. One thing that occurs to me is the apparent reliance on Twitter in your stories. I don’t know if this is something I have failed to understand, but it seems to me that the technology/system should be able to work effectively without the use of Twitter. Twitter just adds another layer of something you might potentially miss/not see. Do you have any thoughts about this? Personally, I have had experiments with various different approaches to collaborative writing on fedwiki, and I see fedwiki more generally as having eclectic overlapping strands. There is an interesting discussion about pros and cons of attribution / (relative) anonymity at [[Discoverable but not obvious]] http://frances.uk.fedwikihappening.net/alex.au.fedwikihappening.net/discoverable-but-not-obvious/journal.hapgood.net/discoverable-but-not-obvious/maha.uk.fedwikihappening.net/discoverable-but-not-obvious/jon.sf.fedwikihappening.net/discoverable-but-not-obvious . That example was one that ‘worked’ without twitter. The example in para 2 of the post above is an example of a post with (attributed) commentary included as part of the developing post. I don’t know if/what the backchannel was for this example. Thanks for describing this using a story, Frances — so illuminating. In practice in FedWiki so far, many have used multiple backchannels, as you say. 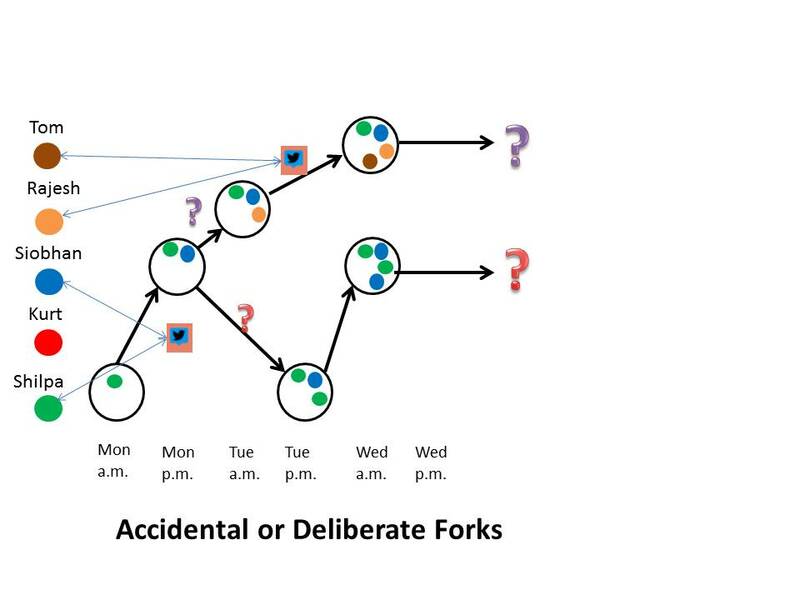 Each of us acts in social media networks and ecosystems which may or may not overlap — so any of the conversations (Fedwiki, Twitter, blogs) will never tell the whole story, yet each will leave artifacts that others may pick up and respond to… more forks! In your story, I am most interested in the characters’ interpretations of what happens in the wiki. A new fork can do so many things: add, expand, comment, support, challenge, change, delete, etc. The fact that someone may fork an earlier version of a page (a) because they cannot see the later versions, like Shilpa, or (b) because they -want- to fork from an earlier version, or (c) by accident (! ), only complicates things. What is the human interpretation of such changes in the wiki? You note the surprise on everyone’s part at the unexpected changes. Shilpa and Siobhan also may feel misunderstood, frustrated, or even annoyed. I wrote a little bit about the importance of trust in my summary Fedwiki blog post. When networks of trust exist, changes will likely be interpreted in an open and generous way. When networks are open, and trust has not (or not yet) been established between participants, interpretations will be more diverse. What happens at the critical points you describe above is so important — and I am guessing this is why you presented this story (?). The point at which differences arise could be a jumping-off point rather than a breaking-off point. Any of the page contributors could reach out to the others to initiate a discussion. How do we do this? Do we rely on individuals to choose their own way to do this — either within or outside of Fedwiki? Thanks so much Catherine, you have given me so much more to think about, and I will try to post a considered response to all the interactions in due course. Reading what you said about the stories made me look at them anew. They did emerge from the process of constructing the diagram rather than being born fully-formed. First I drew the diagram on paper but as Santa didn’t bring me any coloured pencils, I had to use pastels and it and my fingers got a bit messy so I had to resort to Powerpoint. Then I wrote the accidental story with an alternative interpretation vaguely in mind. To be honest, I think we are lovely people at #fedwikihappening (some now moving over to #fedwiki) and I feel a bit chary of being critical too soon. But I realised that if I didn’t capture some of my uncertainties and reflections now I would lose them. So my second story hinted at divisions (like the club) and how these may ‘really’ impact on what is happening in a federated wiki without necessarily being ‘apparent’ (an example of fruit salad formatting there). Two things amused me when I looked at the finished diagram and stories. First, I had split the forks along gender lines – coincidence? Second, I noticed poor old Kurt was left out so In included him and invented a possible role for him. These stories don’t give voices to complete human voices, as Belenky et al did in Women’s Ways of Knowing, but maybe they can help surface the joy, uncertainty, angst. I am glad you mentioned trust as I have been thinking a lot about this during the happening and over the last year in general. Absolute trust is rare and precious, sometimes sadly temporary. We can’t achieve absolute trust or ‘community’ (except in a rather bland sense) across large-scale wikis or the Internet. Avoiding polarisation, employing ‘swift trust’, listening and watching for (inevitable) problems and opportunities, developing repair strategies: these all seem to me to be examples of love that can scale. For me, we need sometimes to look beneath the surface and not be dazzled by the undeniable excitement of it all. One last thing Catherine, I was very interested to discover that you were born and bred in US but living long term in Ireland. Does that give you special culture-bridging powers? and can you please spray them on me? Hi Frances – wow! You’ve obviously tapped into something wonderful (or at least wonderfully complex) here 😉 I always enjoy your writing, and your thinking, but the notion of “examples of love that can scale” is especially powerful. Thank you. I recall Glynis Cousin (once again) who has spoken about the “unreflected emotional substructure to teaching and learning”. I sense that this emotional substructure is what is grabbing us both about Fedwiki at this stage — and not just us. I know that many in Fedwiki, especially Mike, are thinking about what Fedwiki can and will mean for people, within and beyond the wiki pages themselves. Thanks for starting this particular discussion thread about that — and beginning with a drawing and a story. Hello to all. I read this post yesterday and thought about it all so hard as I was going about my day. I still haven’t written a blog about #fedwiki directly as I feel that I’m still thinking about the whole thing. Why have I loved it so much, when so much about it is so frustrating? Why do I think it’s a model for a new way of imagining higher education in a less broken state than we see at the moment? Just as I think I get it (usually while hanging out washing) I lose it again. So all I know, truly, is that this thing has got me thinking. One factor that completely surprised me was a kind of cultural forking within the #fedwikihappening community, between those writing about its technical capacities, and those writing about the cultural issues, especially in relation to feminist thought. I felt this was a very generous and important conversation and I think it’s unfinished for me. Maha’s post about the exclusions and marginalisations of the Anglophone web–who speaks, who is heard–also very important unfinished thinking to me. So here, forking seems to me to capture both of these issues. Technically, it drives me nuts. Culturally, it really makes me sit and think. The model for our experience of forking is backchanneling itself. We already know how this works. A few days ago George Veletsianos asked a question on Twitter. The conversation that goes with that immediately fractured into several pathways, even on Twitter itself. If you come to it late, and trace back, you’ll miss some of those pathways. This is where platforms like Storify ply their trade, really — because there’s a felt need to bring it all back together again, to capture all of it. To me we won’t really understand how to work skilfully with what forking does (as well as what it doesn’t do) until we figure out what makes #fedwiki a rich experience, and maybe think a bit about the circumstances in which we might actually use it. That is, it’s not a baby wikipedia. It’s not a group blog. It’s not a shared document. It’s not Twitter. I think Frances is right: it’s a place we’re making samples. Perhaps it’s a quilting bee. To me, it’s always been a studio. (Did I mention how much I hate the factory metaphor?) I feel like I walk in and see you all there, making your own things, and the space is relaxed and there’s enough light, and we get to see what we’re all doing. But then forking undoes me again. I want to see what you’re doing, and what you did since yesterday, and I still don’t quite know how to do that. Update. A very short story. Kate wrote a page. Jenny forked it. Kate realised overnight she’d missed something important. She updated the page. She tweeted Jenny to let her know about the new content. 🙂 love the stories. Seriously though, scale is an issue. I wrote a stub in fedwiki for models of collaborative writing and I was thinking about the small and intimate approaches where a few people consciously weave ideas, and the larger-scale happenstances where ideas collide. I think there’s something to be said for time-bound use of #fedwiki, as in the happening model. I’m also wondering about #fedwiki for a topic-focused approach. It’s a naturally good brainstorming environment I think. What could sustain it over time as a community, I’m not sure, but I think Jenny is right to be thinking in terms of collective spaces. So the dilemmas of scale then divert to sustainability, trust (as Catherine mentioned) and inclusivity. What I’ve loved about #fedwiki is the collision of ideas. I’ve learned so much. But now I can’t find most of it. It’s like all the laundry flew off all the washing lines at once, and landed in a heap. I am already feeling quite invested in both fedwiki as a technology and as a distributed space into which I might ‘fit’. I am wondering about having my own fedwiki (currently looking into activating my own, currently dormant domain). What I imagine is that I would manage my own space/pages which would then slot into whatever distributed communities I belonged. A model I have enjoyed when creating a page is to use search (within my current distributed context) to find related pages then use/ connect to them in what I write. Could that help you look through the laundry without folding and sorting it first? Shouldn’t there be a way to easily find everything one has ever forked and be able to tag and search it easily? And choose which to “follow”? I love that this conversation is still going on — thank you both 🙂 I have just a couple of minutes now, but re: finding pages, I think this is where using forking as “liking” comes in. I tend to fork only when I add or edit a page. But a few times I have forked a page because I was intrigued and I wanted to return to it. When I click Recent Changes (without clicking on any neighbourhood first, just from my own page), I can see all the pages I’ve forked. And now I’m very glad I forked those pages that sparked my interest. Not sure if this is what you are doing, Kate… and Frances’s suggestion of searching is very helpful. I too have been frustrated a few times at not being able to find a page that I wanted to return to — it’s just lost to me… but will keep trying! Hiya, I responded on fedwiki earlier, now enjoying the comments here! I replied to your reply on fedwiki @Maha but you might get a notification of this reply to point you back to wiki. I like Kate’s description (paraphrased) of technically frustrating but culturally curious. And take your story France’s and add maybe another four people and maybe 4 more variant forks. I just had a small case of just two forked edits of something I posted and what a manual process it took to even compare three versions. I still maintain this story and what frustrates is is trying to use #fedwiki to create convergence of writing, and frankly it’s swimming upstream. I find it better to use at a more granular level, where things are more disaggregated and then try to pull together things that might converge in the way one does with note cards, but perhaps that next level is done in another space. And the group size is a key factor. Two people back and forth? I can see that. Best part though is conversations like these. One of the themes coming through from the shared and personal experience is this idea of Cooperation vs Collaboration. I think we’re too used to automatically assuming that group work has to be collaborative. Mike’s post bought it home to me that no – the difference here is that it’s actually cooperative. I think a cooperative approach is a significant shift away from the norm – and perhaps mirrors the rise of autoethnographic research that some others have picked up on – because it actually injects the self back into the work. Despite the sell of personalisation so much of what we do, see and read is effectively depersonalised – anything that vaguely provides a clue to a personality or identity is stripped away. I think this kind of connective (rather than collective) approach provides a better way for us to learn. In many ways it’s more a kin to our existing social experiences of dealing with individuals rather than the hive mind that collective processes tend to foster. Yes there are technical issues – but that cultural curiosity and the embedded potential have made this a really worthwhile experience. Thanks for your comments Tim. They are making me think. I have seen your fedwiki post on cooperative authoring. Re cooperation vs Collaboration, I think that Mike made the point that much educational use of Wiki was neither. The affordances of a particular technology may make it easier to conduct, say, cooperative behaviours but they don’t determine that particular type of behaviour. I don’t think we can separate out the technical affordances of fedwiki from the ‘culture’ of the happening or the social and technical aspects of the ‘fedwiki-making’ community. We have to try to understand them in the context of each other. I am curious/ puzzled by what you say about injecting the self back into the work. How does that fit with the ‘muting’ of the self in http://frances.uk.fedwikihappening.net/journal.hapgood.net/discoverable-but-not-obvious ?Cooperation and Collaboration are both interesting patterns of working together and I am thinking hard about they can/will work on federated wikis. Frances, thanks for the conversation. I was not captivated by fedwiki, and I’ve been waiting a long while to write about it because I’m not confident I know why and because I don’t want to dampen enthusiasm for the efforts. Also, I did not dislike fedwiki, but I did not seem to make it fit into my thinking/writing/connecting routines. I most did not like “muting of the self”, which seems contrary to the spirit of complexity which places observers in the thick of things rather than moving them to the fringe as an objective onlooker. I think meaning emerges from a rich context that includes the writer, and something about fedwiki made it feel contextless to me. Or more accurately, I didn’t like the context in which my ideas appeared: bare little boxes surrounded by flags. I struggled to connect to ideas in empty space, but I’m willing to believe that I simply didn’t get the context. Also, I know that this was a bit of a demonstration, and perhaps I should have brought more of my own context (BYOC, you know). Next, I wasn’t sure what I was gaining. I need a compelling benefit to encourage me to change, and I didn’t see that benefit given the way I think and write. Still, I did not dislike fedwiki, though it may seem so, and I can easily see myself trying it again, perhaps in a richer context—say Rhizo15. @cogdog thanks for your comments – I am thinking a lot about granularity and synthesis/ convergence (or plurality of those) but it may take me a bit of time to say anything coherent. Agree that group size is factor – also time dimension/ frequency of activity. Next Next post: A table of cMOOCs – can you improve this? Becoming part of a family of artists: a journey – Frances Bell on Institutional fragility and resilience? Frances Bell's Blog - home at last – for all the mes by Frances Bell is licensed under a Creative Commons Attribution-NonCommercial 3.0 Unported License. Based on a work at francesbell.com.